Listed on the Tokyo Stock Exchange JASDAQ(Standard). Moved head office of HIRAYAMA (Thailand) Co., Ltd. to Muang City, Thailand. HIRAYAMA (Thailand) Co., Ltd. owned JOB SUPPLY HUMAN RESOURCES Co., Ltd. (currently consolidated subsidiary) after acquiring 95% of its shares. Opened Kita-Kanto Training Center in Ota City, Gunma Prefecture. Established Hirayama Division Preparation Co., Ltd. (currently HIRAYAMA Co., Ltd.) to be shifted to a holding company structure. 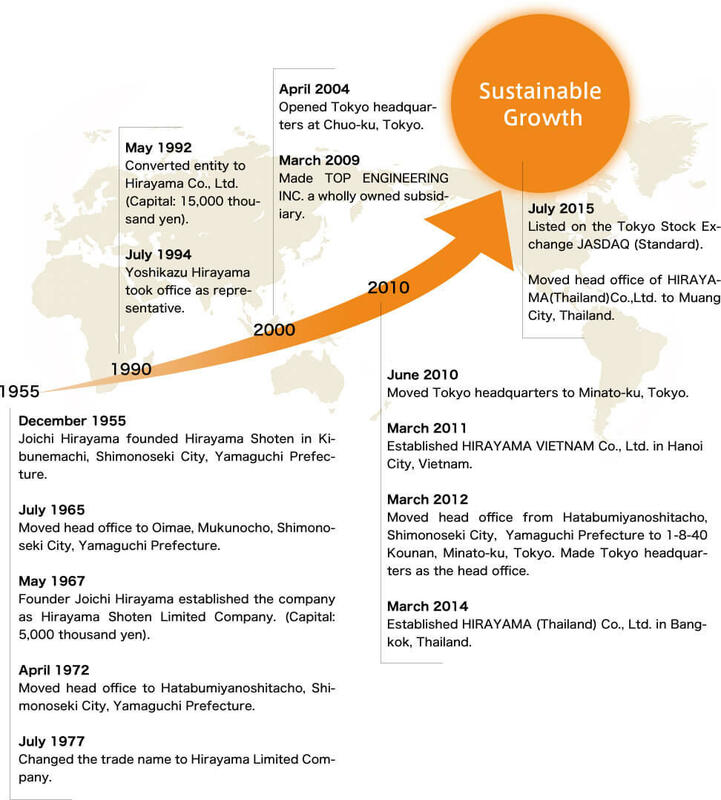 Established HIRAYAMA LACC Co., Ltd. in Minato-ku, Tokyo. changed the name of "Hirayama Division Preparation Co., Ltd." to "HIRAYAMA Co., Ltd." as business successor.